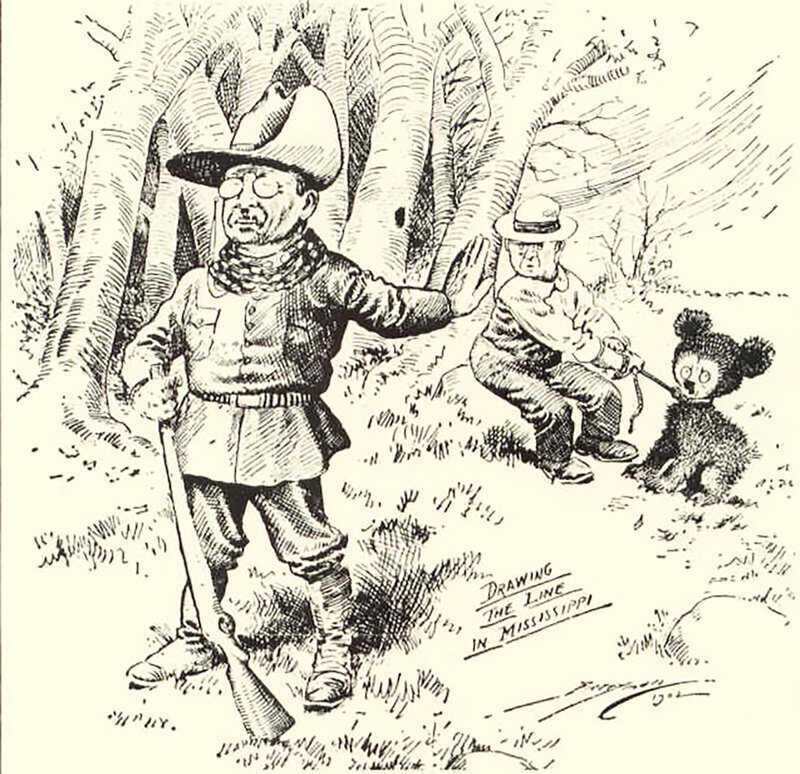 In November 1902, TR went on a bear hunt to Mississippi, but game was difficult to find. Eventually, a small black bear was cornered by the hunting dogs. The president was called over to kill the bear, but he felt it was unsporting and refused. Hearing of this event, artist Clifford K. Berryman of the Washington Post created an amusing cartoon called "Drawing the line in Mississippi." People across the country were delighted by both the event and the cartoon, and this prompted several toy makers to begin manufacturing stuffed toy bears named for the president. The "teddy bear" immediately became one of the world's most beloved toys. According to the "Oxford English Dictionary," bully pulpit means "a public office or position of authority that provides its occupant with an outstanding opportunity to speak out on any issue." It was first used by TR, explaining his view of the presidency, in this quotation -- "I suppose my critics will call that preaching, but I have got such a bully pulpit!" The word bully itself was an adjective in the vernacular of the time meaning "first- rate," somewhat equivalent to the recent use of the word "awesome." The term "bully pulpit" is still used today to describe the president's power to influence the public. The term "muckraker" was coined by TR in the speech The Man with the muck Rake, 1906 and expressed his disdain for the most zealous members of the reform movement that began during his presidency. TR used the word in reference to a character from one of his favorite books, Pilgrim's Progress. The character was so busy raking up muck that he could not see a heavenly crown over his head. One of the most famous Progressive era muckrakers was Ida Tarbell, who caused a sensation with her "History of the Standard Oil Company," an account of how John D. Rockefeller ruthlessly crushed his competition to become the first American billionaire. 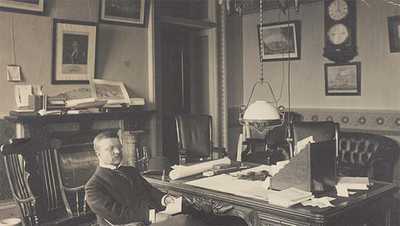 The muckraking movement began in 1902 and was a catalyst for a number of important reforms, but effectively ended when the U.S. entered World War I.
TR was the uncle of Eleanor Roosevelt, and gave her away at her wedding to her fifth cousin, future president Franklin Delano Roosevelt. Alice, TR's eldest daughter by his first wife, was famous for her wild ways long before she married future speaker of the house Nicholas Longworth. 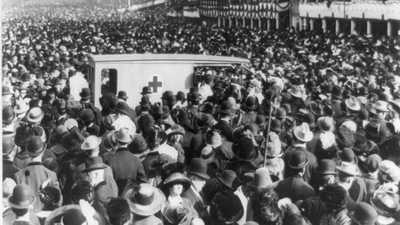 Alice went on to become one of the most controversial, though popular, figures on the Washington scene. At one point it was rumored that she had had an affair and she scandalized people by smoking in public. Typical of her famous biting wit is the sentence she had embroidered on a pillow in her sitting room -- "If you can't say anything good about someone, sit right here by me." She remained one of the reigning socialites in Washington until her death in 1980 at the age of 96. Theodore Roosevelt was one of the four presidents chosen to be honored at the monument on Mount Rushmore in South Dakota. The monument was the brainchild and project of sculptor Gutzon Borglum. He lobbied to include TR, along with Washington, Jefferson, and Lincoln, because TR was one of his personal heroes. 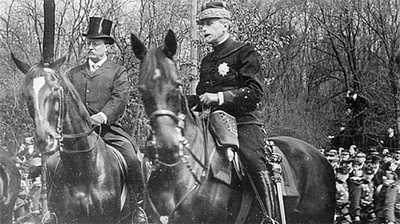 The head of Roosevelt was the last to be dedicated, in 1939.